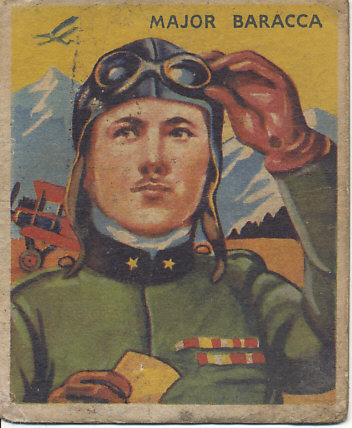 Ace of aces of the Italian army, he had 34 victories to his credit when his untimely end came, June 21, 1918. He had made over one thousand flights over enemy country, and had been successful on 70 bombing expeditions. The day he was killed he had been up 5 times, but finally was met by a number of enemy planes at once. One of them put a bullet through his head and down he went. 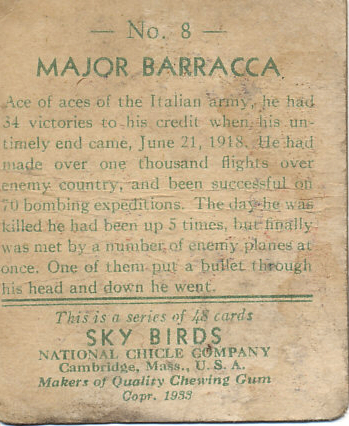 Cambridge, Mass., U. S. A.
Francesco Baracca was Italy's leading ace of World War I, killed on June 21, 1918 during the failed Austro-Hungarian Piave Offensive. 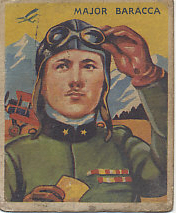 Baracca commanded the 91a Squadriglia and had 34 victories to his credit. At the time of his death he was flying a Spad XIII in a strafing operation. Baracca had his first victory on April 7, 1916 flying a Nieuport 11.